While I have not been brewing much in the recent past, I have been aging a few brews. 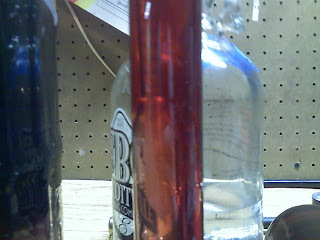 The first was my melomel that I brewed earlier this year. It's been aging for three months in secondary and ended off with a FG or 1.026. It's pretty sweet, so I topped it off with a few pints of water so that the sugar would get cut a little. I had a few tastes and I have to say, it's pretty good. 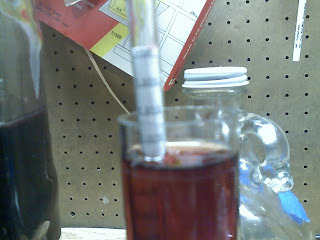 I am carbonating and hope that they carbonation gives a little bite to offset the sweetness. 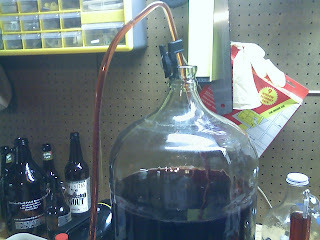 The second project was the bottling of the Christmas Ale. I decided on a name and made up labels using Bottle Your Brand. They were fast and the price was decent. The thing that I liked was that they have a template for your label so you don't have to use one of the generic ones that they have. Once I get a picture of one of my bottles, I'll be sure to post it up. Finally, I am trying out Word Press as my blogging utility. I am playing around with it now to see what I think of it, but if your interested in taking a look, please feel free to check it out at cnybrew.wordpress.com. Let me know what you think. Cool. I'm brewing my holiday brew right now. Not something spicey, just a good tasting session brew for a family holiday party. Thanks for the shout-out, Travis! We loved your beer labels, they're hilarious and turned out great! Nice! Glad you guys liked! You have a good business going and the labels came out awesome. I'll be posting up some pictures of the bottles with the labels on them soon. Your brewing will be a future experience. Keep the good posting! I'll drop by often. Reed, my brother-in-law is a Roch guy and that's one his "hand me down" growlers that I use. I need to hit up the Roch brew scene a little more than I have. There is a lot to see out there. Jackst - I am glad you stopped and don't worry, I'll keep on brewing, just for you!